The word atlatl is meant to be in a song especially when used with battle! Our son, Peter, saw this performer, Bhi Bhiman, perform at a concert in San Francisco and happened to find this “atlatl” song. Check it out and don’t go into battle with a broken atlatl! One of the nicest things about working at Thunderbird Atlatl is the people we meet as we travel around or on the phone when you call our shop! We’ve been making atlatls for over 20 years so we’ve met a lot of great people over the years. Thank you all for your support and stories. We love hearing about how much people enjoy using the atlatl and that they appreciate our products. Our atlatls are being used all over the world even in Mongolia thanks to our son, Peter! 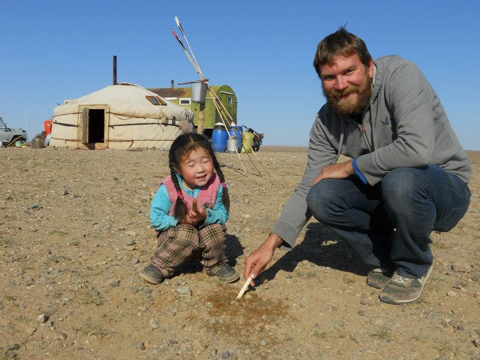 Peter recently traveled to the Gobi Desert and introduced a family he stayed with to atlatls. Thank-you! I received it! Its awesome! Definitely worth the wait!! Thanks, I am very pleased with the atlatls and am sure I will be with the darts as well. I will use your company for any future needs and recommend you to others. Love your products! We have had HUNDREDS of youth and adults using your atlatls as part of our programs. I took my new toy, a Kanakadea, for a maiden test flight today. I’m totally hooked! I even had the neighbors, who had never heard of such an instrument, commenting favorably. I got my atlatl today and it was in great condition, thank you for packing it so well. I used it today at lunch and was shocked at how easy it is to pick up on. Thanks for the atlatl, I can’t wait to get a deer this year. 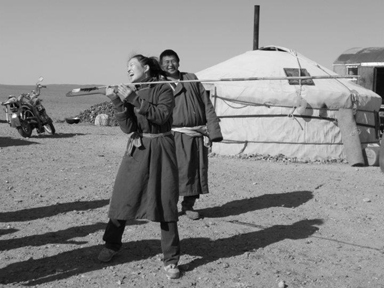 A young woman in Mongolia tries a Catatonk atlatl! Peter Berg visiting with a young friend in the Gobi Desert of Mongolia. Thunderbird Atlatl darts are in the background near the yurt or ger. A hot/cold hybrid automobile drive train uses fossil fuel to run a small engine that compresses its own products of combustion, mixes it with liquid nitrogen that runs pneumatic engines that power the drive wheels of the car. Typical internal combustion engine vehicles are less than 20% efficient because they loose large amounts of energy out of the radiator, tailpipe, radiation from engine parts and drive train friction. The Hot/cold hybrid drive train system uses both sides of the thermodynamic equation to produce kinetic energy to power the car. The heat generated by the burning of fuel and the compression of the products of combustion mixes with and boils the liquid nitrogen creating high pressure utilizing heat that would normally be lost. The liquid nitrogen absorbs enough heat to go from ?196 �C or ?321 �F to over the boiling point of water. If the liquid nitrogen were not confined to its pressure tank it would fill a volume nearly 700 times its liquid volume. This concept drawing shows the small internal combustion engine to the left, attached in line to a compressor. The exhaust from the engine goes directly into the intake ports of the compressor. As the exhaust gasses are compressed they become hotter. At this point the hot compressed gasses are mixed with liquid nitrogen through a special valve. The mixture passes into a tank which has provisions for removing water before being used in the pneumatic engines located as close to the drive wheels as possible. So Where Do We Get That Much Liquid Nitrogen? The largest problem with wind electric power generation is that for every megawatt of power a windmill may produce you need to provide an equal amount of alternate electric power somewhere else that can operate when the wind isn’t blowing. The alternative power station must be able to go on and off as the wind changes and respond immediately to demand. Windmills also have problems operating in very cold weather. This proposal solves several problems. Windmills could be designed to directly power large capacity compressors connected directly to the wind turbine in the nisscell at the top of the mast. The Von Linde system of converting gasses to liquids would be used which essentially uses a multi-step process where air is repeatedly compressed and cooled. The initial cooling fins containing hot water which is a byproduct of the Von Linde process could be located in the routers of the windmill which would make it usable in even the coldest weather when normal windmills are dangerous to operate because of icing. Windmills used to generate liquid nitrogen would work best in near blizzard conditions when the wind is blowing hardest and the cooling system is most efficient. If windmills were used to make liquid nitrogen, when the wind did not blow it would not cause the immediate need to turn on an alternate power generator. Tanker trucks would pick up the liquid nitrogen when the wind mill’s tanks were full. Wind mills can be located close to where you need to fuel your vehicle instead of Saudi Arabia. It is easy to operate small engines on liquid natural gas by changing the carburetor and adding a pressurized tank to hold the fuel. Liquid natural gas is energy dense. Not only does it contain the energy of combustion but also, like the liquid nitrogen, it has a reserve of energy contained in its heat of vaporization that can also be used to help propel your future car. The flow chart above shows several ways to produce liquid nitrogen and the byproducts that can be gleaned from the process. Symbiotic relationships with other industries could be formed. An example of that would be a hospital located near windmills that could use the hot water, oxygen, and xenon produced in the process of generating liquid nitrogen. Steel mills that use a lot of oxygen could form symbiotic relationships with auto fuel suppliers by supplying them with nitrogen rich gas left over from separating out the oxygen. Welding supply companies use argon and oxygen and could liquefy the nitrogen for use as auto fuel.